This beauty has glossy enamel that makes it an equally durable stainless steel. While its globe shape is meant for quick heating, the spout lever’s pushbutton is intended for one-handed pouring and filling. Faberware also ensures that customers do not hurt themselves by providing a stay-cool lid finial and silicone handle. With this product’s cheerful whistle signal upon boiling, you will be one happy buyer with this in your kitchen. In the line of tableware, cookware, and kitchen appliances and accessories, Faberware is no doubt a league of its own. From the 1900s to this day, it continues to be recognized as a leading manufacturer of durable and new innovations that help maintain not only cooking standard but also kitchen safety. And do you want to know what its secret is? This top-selling kitchenware brand attributes its success to its ability to grow with the times and adapt to modern technology in meeting the demands of household and professional kitchens. 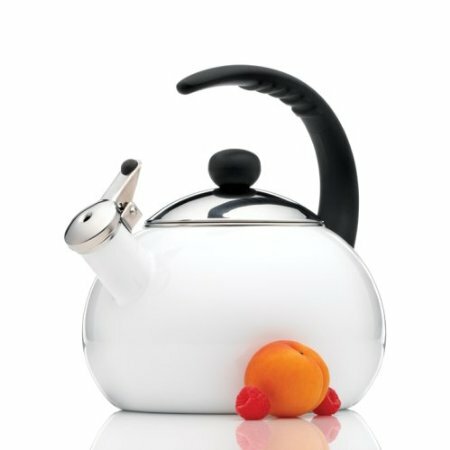 Other than utilitarian use, Faberware also boasts of its stainless steel teapots and kettles, which come in various colors and styles to match every person’s kitchen environment. Check out the list below for the top 5 Faberware teapots and kettles. These are just some of the handy and elegant kitchen gadgets created by Farberware. Indeed, the brand knows how to create a perfect mix of quality and style. Whether you are looking to buy an electric kettle or a teapot, whether you want to compare various brands or even when you want to see which model from one specific manufacturer is the best, the TheTeaSupply.com reviews will get you to the most viable conclusions. Check out all the tea product reviews from the TheTeaSupply.com!